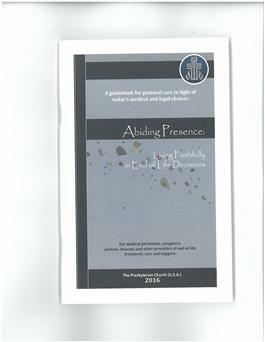 Abiding Presence is both theological and ethical reflection on the end of life, and practical guidance on a range of new choices that may prolong life or provide palliative care. It is meant for patients and care-givers; ministers, deacons, Stephen Ministers, and family members who are encouraged to support informed decision-making. A brief resolution is included at the end of the handbook which addresses public policy questions, including assisted suicide, advance directives, and healthcare proxies.